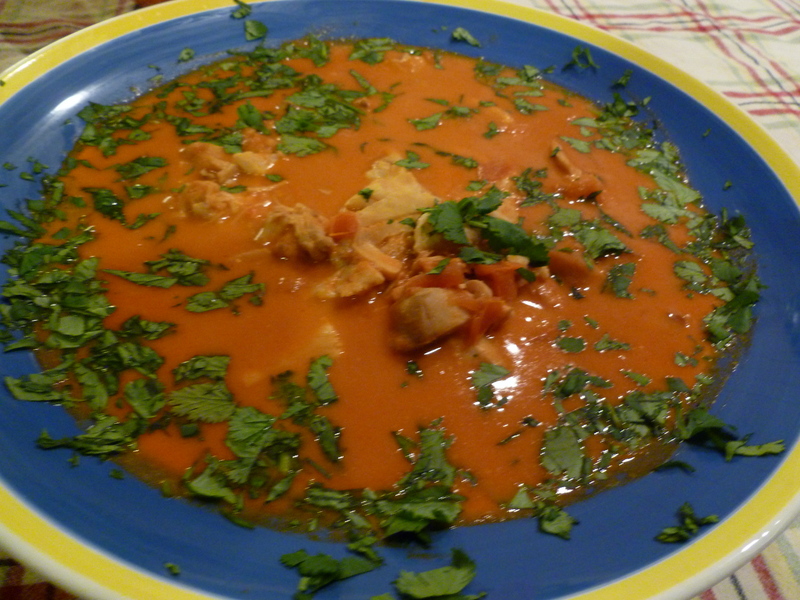 This is a traditional Brazilian dish, known in Brazil as “Vatapa“. It is very popular along the coastal States specially the States of Bahia and Espírito Santo. This dish was heavily influenced by the African culture through the Africans who were brought to Brazil as slaves to work on the Plantations during Colonial times. There are several ways to prepare this dish depending on what State. It is best cooked in an iron skillet or dutch oven. Originally, it is very spicy but that is totally optional, the recipe I present here is definitely more mild. I showed this recipe on national television on the “Home Show” in 1992, since then I have made a few changes adapting to a better and lighter version. 1lb raw shrimp, peeled and deveined. 1lb red snapper cut into pieces ( can also use rock fish or orange roughy). 1/2 large onion finely chopped. 1 can 16 oz, organic tomato sauce. 1/2 cup fresh chopped cilantro. Squeeze lime juice over seafood and set aside. Heat olive oil over medium heat, cook onions and tomatoes until they are soft, stir in garlic. Add tomato sauce, cover and let it cook until sauce is bubbly. Add coconut milk, salt and crushed red pepper, let it cook until bubbly again. Meanwhile, bring some water to boil add place raw shrimp in hot water for 3 minutes, drain. Add shrimp fish and scallops to sauce, let it cook in sauce until sauce is bubbly again, about 10 minutes. Stew can be served over white rice, it is delicious that way too!